How many Freedom of Information requests are sent through WhatDoTheyKnow as compared to those made directly to public bodies? Our new mini-site lets you explore Cabinet Office statistics in comparison to numbers from WhatDoTheyKnow. Every quarter, the Cabinet Office releases Freedom of Information stats for a collection of central government ministries, departments and agencies. This provides a good benchmark for understanding how requests made from WhatDoTheyKnow relate to requests made through other routes. Back in 2010 we ran several blog posts about this, though we haven’t released any comparisons in recent years — and we’re now making up for lost time. In 2016, WhatDoTheyKnow was the source of 17.14% of requests to audited public bodies. On the other hand, most WhatDoTheyKnow requests (88.51%) went to public bodies that the Cabinet Office figures don’t cover. One interesting conclusion from this is that most FOI activity in the UK is not immediately visible from the official statistics. You can read more about what we learned from the numbers, or explore the data for yourself on the mini-site. If you’ve used WriteToThem, you’ll know that two weeks after you submit a message to your MP, we send a follow-up questionnaire to check whether you received a response. They’re now live, so you can go and check exactly how your own MP did — just enter your postcode. Because we’ve been running these figures since 2005 (with a gap between 2008-13), we can make some comparisons. We’re disappointed to see that the responsiveness rate of MPs has been steadily declining. In 2005, 63% of respondents indicated that they’d had a reply; this year, that’s down to 50%. Before we analysed the data, we thought that new MPs, elected in 2015, would perhaps perform better than the jaded incumbents. Not so: on average ‘old’ MPs responded to 53.07% of constituents’ messages, while the newly-elected managed only 46.10%. One new MP, Marcus Fysh, MP for Yeovil, came in at 635 out of the 642 MPs eligible for inclusion. Receiving more mail doesn’t necessarily mean you’ll perform poorly. Notable in this respect is Gerald Kaufman, who managed a 79% responsiveness rate despite having the second largest postbag. And being in the public eye doesn’t necessarily impact an MP’s responsiveness: Sadiq Khan and Jeremy Corbyn performed poorly, but have done so in prior years, too. Equally, we suppose it follows that a poor responsiveness level doesn’t necessarily impact on electoral success. We were curious to know whether there’s a gender divide when it comes to responsiveness. There is, but it’s very slight: on average male MPs responded to 52% of correspondence; female MPs to 50%. And another thing we’ve been asked about, sometimes by MPs themselves. There is no significant relationship between parliamentary constituency size and responsiveness. In other words, having more people in a constituency does not automatically mean that the MP is a poor responder. Anyway, enough of this — go and check how your MP did, and then tell everyone else to do the same. *This needs a caveat. Our data only covers messages sent via WriteToThem, and, furthermore, only those messages where users completed the questionnaire. You can see the full methodology on the rankings page. plenty of coding, video calls with partners around the world, the occasional conference, and tea. Lots of tea. Oh, and then there’s the annual treat of posing for the team photo on a windy winter’s day. That’s us, above. Damp. Cold. Still believing in the transformative power of digital technologies. We bundled it all together, with plenty of stats, a couple of jokes, and tweets from some of our happy users. Here’s the result. Sit back and enjoy the mySociety Year in Review, 2015. How responsive was your MP in 2014? This post refers to the statistics we published for 2014. If you would like to see the latest responsiveness figures on WriteToThem, please visit www.writetothem.com/stats/. Of course, there are many factors that you’ll consider before you cast your vote in the general election. But we think that one important quality in an MP is that they respond to their constituents. So you may wish to check your own MP’s performance on the latest WriteToThem responsiveness league table. Just put in your postcode and you can see how they did in 2014. When you send a message to your MP using our site WriteToThem, you’ll receive an automated email two weeks later, asking whether or not you received a response. Every year, we take the data from these surveys and use it to assemble our responsiveness rankings. You might think that MPs would be doing the best they can this year, in the run-up to the election. Sadly, that doesn’t seem to be the case: overall, responsiveness has fallen a percentage point since last year, with 46% of emails receiving no reply. You can find all our data and methodology on the league table page. We know that messages sent to WriteToThem may not reflect all messages sent to an MP; we also know that not every message will require an answer. However, we think that, taken overall, our sample size of over 36,000 interactions can be seen as indicative. 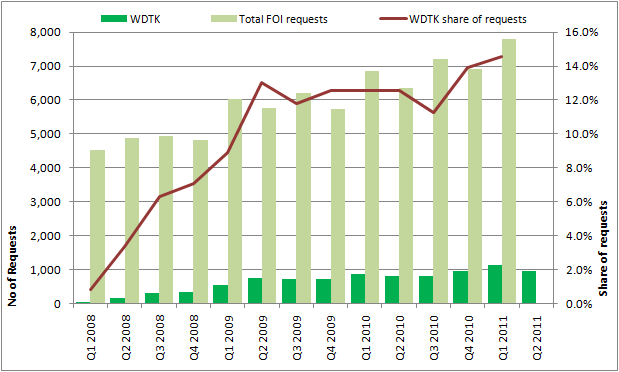 The graph shows our share of FOI requests sent to central Departments of State jumped to 14.6% in the 1st quarter of 2011. Many of the WhatDoTheyKnow users contacting the Home Office & UK Border Agency are trying to find out information about their own immigration case. We regularly receive emails from applicants asking for help, as they have often been waiting months (or even years in some cases) for an official update to their case, often with the UKBA holding on to identity documents or passport. Applicants then feel they have to resort to making FOI requests. Many of these are auto-replied by this standard FAQ, and applicants don’t receive a personal answer. The large 29% share of all Home Office requests suggests that the normal contact methods to keep people updated aren’t working or even that their service is simply struggling with demand. It’s also likely that they don’t consider these types of requests as formal FOI requests, so it is worth noting that we are likely to be slightly overstating the percentage share figures. Free schools were a popular topic for the Department of Education – 9 out of 81 requests were on this subject, and nearly all were refused on the basis that information would be published at some unspecified date in the future. To understand the limitations of the data analysis, please see here. One interesting trend that has been consistently seen is that FOI requests are more frequent in odd-numbered quarters compared to even ones – if you have any ideas why this may be the case, please add them to the comments! Transparent screen, by Kathy McLeod, used under the Creative Commons licence, with thanks. 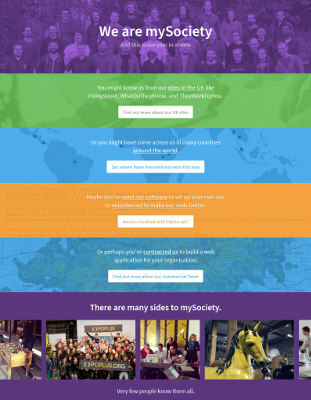 At mySociety we like transparency – it’s baked into most of our projects. TheyWorkForYou attempts to make it easier to find out what your MP has been doing in Parliament. WhatDoTheyKnow tries to make it easier to find out what’s going on inside other public bodies. FixMyStreet and the upcoming FixMyTransport also use transparency to help get problems resolved. We think transparency is a good thing for many reasons, but one of its rarely mentioned virtues is how valuable transparency can be for the people within the organisations which are transparent. Transparency can be useful because it means people outside an organisation can make critical, constructive suggestions about how you can improve, and it lowers the odds that people in one part of your own organisation will be ignorant of the activities of people in other parts. To that end we commissioned Tobias Escher of the Oxford Internet Institute to conduct detailed analysis into two of our major websites – TheyWorkForYou and WriteToThem. We were not highly prescriptive in our instructions, and we certainly didn’t ask Tobias to ‘discover’ pre-determined findings. All we did was ask Tobias to find out who was coming to the sites, what they were doing, and whether or not the sites could be considered to be succeeding. We didn’t do it for a PR stunt: we did it so we could learn from our mistakes, and so that we could share those learnings with others who might benefit. His detailed, quantitative analysis holds the sites up to mySociety’s own stated aims, for the first time. And we’ve published both documents, in full, below. It was great to discover that we have, indeed, attained some of our goals by running these sites. For example, one of the reasons we set up TheyWorkForYou and WriteToThem was to make representatives accessible to people who were newcomers to the democratic process. It was therefore heartening to read that 60% of visitors to TheyWorkForYou had never previously looked up who represents them, and two in five users of WriteToThem have never before contacted one of their political representatives. But, as you would expect with any properly neutral evaluation, it’s not all good news. Our sites aim to reach a wide range of people, but compared to the average British internet user, WriteToThem users are twice as likely to have a higher degree and a higher income. It also seems that users are disproportionately male, white, and over 35. These figures and many more are available within these highly readable papers – Tobias did a terrific job in gathering and analysing a huge amount of data, and then making it easy to understand. These reports are rich with data, from how visitor numbers boomed during the MPs’ expenses scandal to which MPs most people sign up to receive alerts about. You can also read how a budget airline almost brought a site to its knees in 2007; what part Joanna Lumley plays in our history; and how many visits to TheyWorkForYou actually come from within Parliament itself. TheyWorkForYou and WriteToThem have inspired many people around the world to set up similar (and not so similar) sites inspired by the vision of using the Internet to lower barriers to democracy. However, until now we’ve never seen a really clear-eyed assessment of what seems to work, and what doesn’t. If you’re at all interested in using the Internet to engage people with democratic systems, Tobias Escher’s excellent research papers will make a compelling read. Thank you Toby! …and do come back and tell us what you found interesting. We hope to publish two evaluation reports like this at the start of each new year from now on. Next year’s sites will probably be FixMyStreet and WhatDoTheyKnow. Do get in touch if you’d like to input! At mySociety we love our site FixMyStreet – it’s the epitome of a web tool that gives simple tangible benefits whilst generating a little accountability at the same time. Reports through the site were up 40% last year, so it’s clear that users quite like it too. FixMyStreet has been copied in many different countries, which makes everyone in mySociety very happy, too, even apparently appearing in a slide deck the White House uses to show innovative services. However, it turns out that the cheerfully minimalist, almost wantonly unfashionable user-interface has an unfortunate down side: most people who copy the site look at it, think “That looks easy!” and then cheerfully start coding their own clone. Alas – the very simplicity that makes the site good hides the fact that making a site like FixMyStreet really work well is actually way harder than it looks. What will you do when a government email inbox fills up? What about when administrative boundaries change, due to an election or restructuring? How do you know you’re not scaring users away with careless wording? All the hard-won lessons from these questions have been baked into the FixMyStreet codebase, and we’re only too keen to talk to people about them. 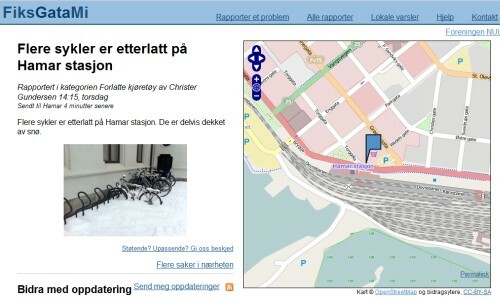 We were therefore particularly pleased when the Nowegian Unix User’s Group (NUUG) came to us to ask if we could help improve FixMyStreet to make it easier for them to install. Over the last month mySociety Senior Developer Matthew Somerville has been working hard with Petter Reinholdtsen and Christer Gundersen of NUUG, and here’s what they’ve managed in just a handful of weeks. The launch of a Norwegian FixMyStreet called Fiksgatami, covering nearly every corner of Norway’s 300,000 square kilometers. Problems reported anywhere within Norway will be correctly directed to any of the 400+ responsible municipalities, thanks to Petter and Christer’s amazing data sourcing skills. As a necessary side-effect of developing this, Norway now has a free, public administrative web service gazeteer – http://mapit.nuug.no. If Norway is anything like the UK this will soon become an indispensable service for many other web sites and mobile tools. The open source FixMyStreet codebase has been upgraded to make it easier to translate into other languages, easier to use different mapping with, and easier to install. These efforts will continue, as we realise this has been one reason why others have made their own versions. All this has been done without forking, so various major upgrades we have planned for the UK version will be exportable later in the year. NUUG’s Fiksgatami is the epitome of what makes civic open source at its best so unmatchably good. It was developed incredibly quickly: just a month to create what is effectively a fully fledged, best-of-breed nationwide e-government service – albeit an unofficial one. Thanks to the hard work of the public servants who fix problem reports, it will make small but meaningful improvements to the lives of a lot of people in Norway. And it has made the free FixMyStreet codebase better and easier for other people to use to help them do the same thing in other countries. I know that at mySociety we are all looking forward to working with NUUG again. And I hope that this story inspires others to look at our code, and to work with mySociety to make FixMyStreet a service that can help everyone who would benefit from it. * We’ll be rolling out updated mapping (including OSM) and more in the UK, soon. 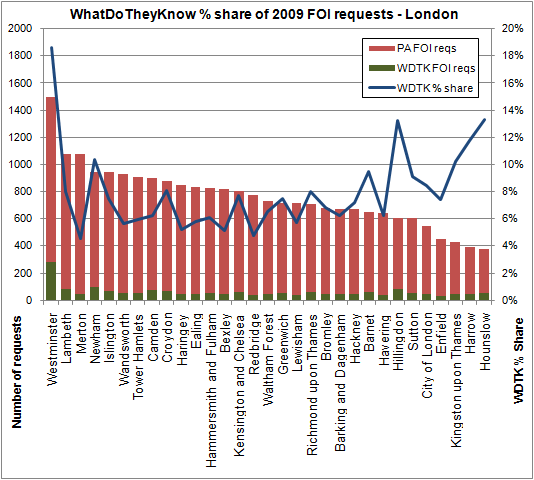 I recently found these requests by James Muldoon covering FOI statistics for the London Boroughs for 2009. As we regularly carry out analysis of WhatDoTheyKnow’s percentage share of FOI requests to central Government Departments of State, I thought it would make for an interesting comparison to do the same for the 33 Metropolitan borough councils, plus the City of London. Below is a graph of the market share for WDTK. Overall, the share for 2009 was 8.1%. During the year, the share did fluctuate quite a bit, and the requests on WhatDoTheyKnow were significantly lower in the 2nd quarter for some reason. The City of Westminster has a much higher number of FOI requests compared to the other boroughs, mostly apparently due to a large motorcyclist parking campaign/protest. 73% of all requests made to Westminster via WhatDoTheyKnow in 2009 contained the words “parking”, “motorcycle” or “Verrus” (203 out of 278). I will soon start looking for FOI statistics for Local Authorities outside London, either on WDTK, or via their disclosure logs. The Ministry of Justice encourages Local Authorities to regularly publish statistics on their FOI data. Brent – excluded from totals & comparison as the underlying FOI request is still outstanding. The ICO is apparently investigating. Southwark – excluded from totals & comparison. They said in their FOI response: “due to a serious malfunction of our reporting database we have no access to the data stored centrally”. The data has been re-requested by James to see if the malfunction has been fixed.